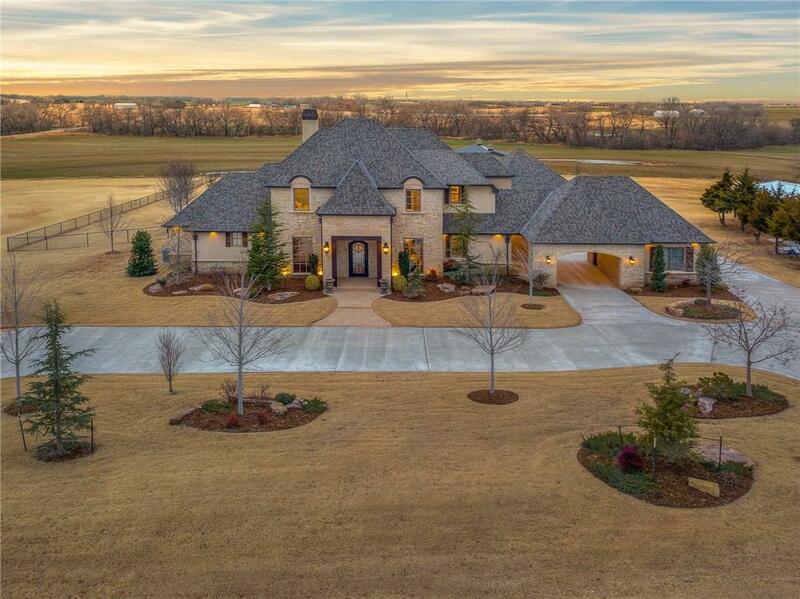 AMAZING custom luxury home in Tuttle. This sought after transitional and modern beauty offers the upmost in sophisticated elegance, upgraded amenities and striking architectural detail throughout. This custom luxury home can be transitioned to any style yet always remain timeless. Large entry opens to a graciously sized living room with a gorgeous of the pool and backyard. The gourmet kitchen is an artistic masterpiece with Wolf & Sub Zero high end appliance package. Nice proportioned room sizes throughout and a great flow for family living and large scale entertaining. Large bonus/home theater room. The custom pool is an outdoor dream with extensive landscaping, waterfalls, grotto, tanning shelf, hot tub and diving rock. There is also a large 36x48 workshop perfect for the car enthusiast or storage for RV (50 Amp). Don't miss this amazing luxury home just 10 minutes from Mustang. 3 car garage at house and room for 4-5 more cars in shop. Over $1M invested in this home.